Medic, HQ. Company 643rd TD BN. It was very nice to hear from you. I am not a relative of Mr. Conklin. I am a dealer in military items. I recently obtained his officialy named Silver Star medal as well as some more of his posessions at a flea market in Florida. I found your website while researching the grouping and thought you might enjoy having the information. I don't have any official documents for the Silver Star only the medal and a newspaper article from the period describing the award and his actions. In additional E-mails I asked Chris if he want to make some copies and he did! It was my pleasure to share the history of this man with you so it will be preserved. Feel free to use the information. Ssgt. Preston E. Conklin's Silver Medal. Hero Medic, For outstanding gallantry April 8, 1945 at Polle, Germany.Staff Sergeant Preston E. Conklin of 103-02 225th Street, Laurelton, today was awarded the Silver Star. He was a medical attached to a Tank Destroyer Company and, according to the citation, he risked his life to search for two buddies who were missing in action. "Moving about on the enemy side of the tank destroyer in the light of its flames under heavy fire, he searched for more then one hour," the citation said, "in utter disregard of his own safety, altough he made a perfect target for the enemy. Several possessions of SSgt. 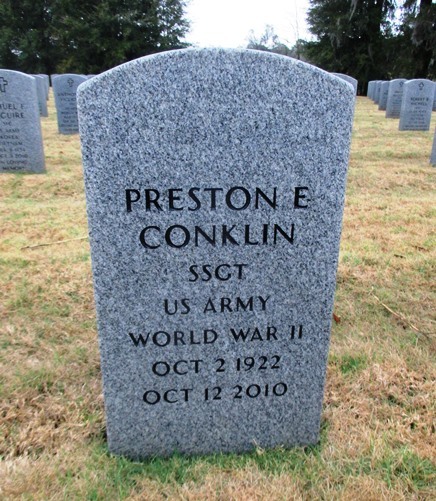 Preston E. Conklin that Chris obtained.